viaLibri ~ The History of the Peloponnesian War, Illustrated by Maps, taken entirely from actual surveys. With notes, chiefly historical and geographical. Third Edition. In Three Volumes. The History of the Peloponnesian War, Illustrated by Maps, taken entirely from actual surveys. With notes, chiefly historical and geographical. Third Edition. In Three Volumes. 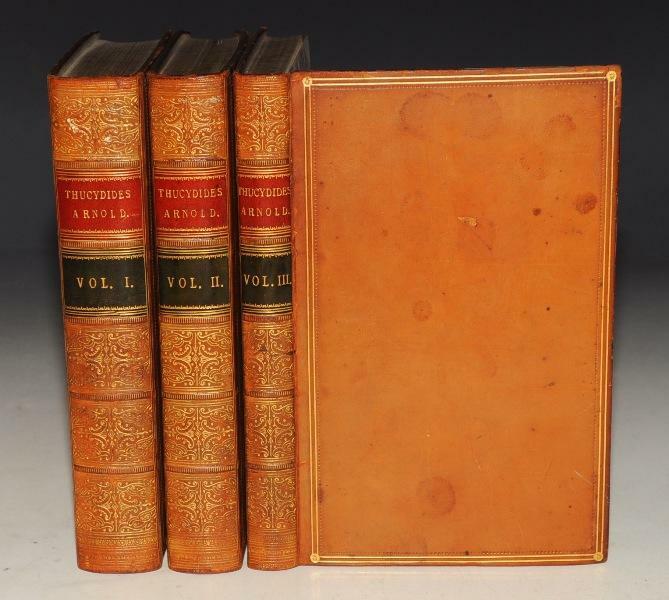 Oxford, London, John Henry Parker, Whittaker & Co., 1847 - 3 volumes. Hardbacks. Approx 9 x 5.5 inches. Bound in full calf leather with red and black leather labels to spines, with raised banding and extensive gilt decorations. Decorative gilt paneled boards and edges. Marbled endpapers and page edges. In very good conditions. Some minor wear to covers; Edges of boards rubbed and corners slightly bumped. Spines a little rubbed. Some dark spots to boards. Booksellers labels to front endpapers ?W.Graham, Oxford.? Also inscription to first blank endpaper ?John M. Freshfield, May 1855.? Some minor light foxing spots to endpapers, else pages all very clean and tight throughout. Folding maps and plans all crisp, clean and bright. 543 + 460 + 286pp. Illustrated with folding maps and plans, 8 plans & 3 sketches.